Described as “the first office-friendly metal 3D-printing system for rapid prototyping,” DM Studio is a complete platform, including both a printer and microwave-enhanced sintering furnace that, together, deliver complex geometries of metal 3D-printed parts in an engineer’s office or on the shop floor. Unlike traditional metal 3D-printing processes, DM Studio requires no hazardous powders, no lasers and no cutting tools to operate. Instead, it employs Bound Metal Deposition (BMD), a proprietary process, to make accurate and repeatable parts, similar to the most widely used 3D-printing process for plastics, fused deposition modeling (FDM). The DM Studio printer extrudes bound metal rods, similar to FDM printers, which eliminates safety and facility requirements associated with traditional metal 3D-printing, while enabling new features such as closed-cell infill for lightweight strength. It reportedly can produce near-net-shape metal parts, delivering the resolution and accuracy needed for functional prototyping. Sophisticated software constructs print and sinter plans for every build and material—automatically generating supports and control parameters to ensure a seamless experience from printing through sintering, according to company officials, without the need for dedicated operators. The system can print as much as 24 cu. in. per day, and maximum resolution is 50 mm. Proprietary Separable Supports make it possible to remove support structures by hand (see photo), while swappable print cartridges make for safe, rapid material changes. And, it reportedly can support hundreds of different metal alloys. To 3D-print metal parts at scale, Desktop Metal launched what it claims to be the fastest 3D-printing system for mass production of high-resolution metal parts today, DM Production. 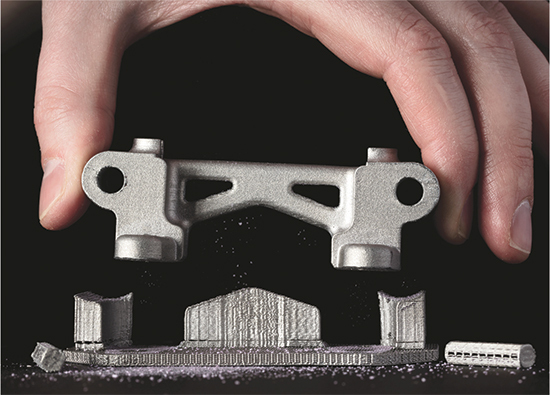 Using new, proprietary Single Pass Jetting (SPJ) technology, DM Production reportedly is 100 times faster than today’s laser-based additive-manufacturing systems, making it competitive with mass-production techniques such as casting. DM Studio is available to reserve in May with shipping beginning this August. DM Production also is available to reserve in May, with shipping slated for 2018. See also: Desktop Metal, Inc.